#1. De-Door. I wanted to get the front door done for a party at Southern Hospitality and more recently for Favorites on the First at The Polo House. I love how link parties are the pin jab to get me moving. Recall last week I painted the front door (here) then watched paint dry. It seems as though everyone has *Spring* and while Spring might have come early here in Minnesota regarding the temperature, we still don't really have the blooming part of it. I do have one flowering shrub on 25 acres. So I clipped a branch and put some flowers on the front door with the burlap and chalkboard tray. #2. De-Clutter: It's Thursday, and for me that means another installment of Bliss De-clutters with Iesha over at Uncluttered Lifestyle. I don't always have time to post my de-cluttering, but each week regardless, I DO un-clutter something just to keep up with her. She does great things, I just un-mess an area, but that feels good to do. I already knew I was not going to rework this desk or do any new deco as it is slated to be removed, but that is no excuse for the mess to pile up. So I put the stuff back on it that I need and it can stay like this till it is tore out. So much easier to think when the clutter is removed. After we tear it out not sure where I will put photos! Under the mess was a few treasures. A box of misc. silverware my daughter makes things out of. It is now in the craft pile. I picked up these metal numbers & letters last September at Junk Market. I'm going to put them on the baskets in the mudroom cubbies and they each stand for something. And a Christmas gift to myself for all those times when I want just a little bit of wine. My very own craptastic dresser. It only has one bad spot on the left there, nothing a piece of trim won't fix. So stay tuned for my first trash picked transformation. And if I can find a trash picking party I'll link up the dresser too! OK, this is NOT a trash picking party, but there are no rules for the Stinky Linky party at HatingMartha so I linked up my free "lemon-aid" dresser. (Thanks to Laura from TopThisTopThat for the idea to call it a lemon). While blog reading I went to look at one thing and of course found something else I had to check out. Vivienne over at The V Spot had a tip for cleaning the grates on a stove. 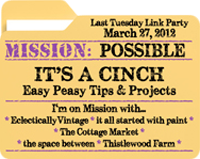 An easy peasy tip and there IS an It's a Cinch party going on. Lord knows I had me some baked on mess to try the tip out on, just needed to pick up Ammonia. Set me back a whole $1.78 and I hardly used any. Pretty powerful cleaning supply for just pennies. Problem is, at Vivienne's the recommended way is to put each grid in a Ziploc and wait 12 hours. The fumes, not the liquid of the ammonia, is what degrease's and cleans, she recommends 1/4 cup per zip-lock/grate. I didn't have 12 hours but mostly I didn't have big enough Ziplocs. And let me tell you, I always thought my Ziplocs were plenty big! So I opted for the next best thing..... my giant size box of plastic wrap - (a Christmas gift from a BFF in 2010 - we dated it to see how long it lasts) and my kitchen sink. Only a BFF knows you well enough to know you will LOVE a giant roll of Purity Wrap. Sounds more like a chastity aid. Remember I'm not the only person who cooks in this house, but I am the only person who cleans the stove. And here is my disclaimer: I only did the grates and trays, not the parts that look like there is white ash from a fire on them. Yes there is white ash from a fire on them. I'm hot when I cook. That part of the stove just got wiped off along with the surround, I didn't feel like scrubbing and polishing stainless today. I loaded up ALL of my grates and drip pans in the sink, poured in about 2 cups of ammonia and then sealed that sucker up with the industrial plastic wrap. The avocados are optional to hold down the plastic, 68¢ each on sale. The smell of the ammonia reminded me of my mom when she was dying her hair when I was little. Stinky. Do not mix your ammonia with anything, and don't stand over it and breath, it is hazardous. In fact don't do this when you are alone in the house, if you pass out from fumes no one would be there to help. If you mess this tip up I am not responsible! For full directions head over to The V Spot, but she's not responsible if you mess up either and end up with ammonia nostrils. I only fumed it for about 4 hours, mostly because I was too anxious to see if it would work and partly because I had dinner to cook. I am happy to report that YES it did work and it worked very well even in that short time. The grates could of used a bit more fumeing, so next time I'll do that part over night for the full 12 hours, but The V Spot Ammonia treatment will be my method of grate cleaning from now on. It was the easiest cleaning on them I have ever done, really effortless. For those of you who already knew this little tip, shaddup! **UPDATE** A smart blogger informed me (and a big DUH fell over my brain for not thinking of it myself).... that I could use a trash bag for this chore, put it in the sunshine to heat up and work faster, and then hose them off in the yard. BBQ grates, oven racks, you name it. So next time I won't have to have a DIY ziplock sink . It's time for the RamSign Giveaway winner to be announced. Thank you to EVERYONE who entered. If I could give a sign to each of my fantastic followers I would, but hey I don't get one either, so I'm in the same boat as the other 52 of you who didn't win. If you have never entered a giveaway over with Angie @Knick of Time then you won't know that I so copied her idea for a random number generator. She uses her family members and I think that's fun, and also much easier than figuring out how to do it the internet savvy way. Besides I thought one of my kids would enjoy it. My daughter said sure, till she saw the camera. My middle son covered his head with a throw. Congratulations Betsy you are the very first Bliss Ranch giveaway winner. "mom.... I have no clue why I just did this". Today I needed to not sit and just read blogs - fun but not very productive. So between reading I painted, and then watched the paint dry... in my jammies. I've gotten used to chalk paint with it's fast dry time, and waiting for regular paint to dry seemed to take forever. Being the impatient decorator I am - I'm quite sure I slapped the second coat on before #1 was dry. I didn't mind a white door, but from the outside the white was boring. I usually hang seasonal flower things from the little hook in the center to jazz it up. The storm door is white, the side lites are white, the door just didn't stand out, it was just a wash of white. Under the white is a nice solid wood door. No way I was going to strip the door when we have perfectly good paint left over from another project. The color wasn't as important to me as it just not being white and brass anymore, so I went for it. A close to wood color. I was thinking of trying a nice vibrant splash of color but I'm not very good at picking paint, and besides I didn't want to get out of my jammies to go buy any. I had to sand the brass hardware and fortunately we had some chrome spray paint, otherwise they would be black 'cause like I said I wasn't getting out of my jammies. A Good Will tray from my shopping trip last week went on the hook. It's big and heavy and I probably over paid for it, but I wanted it. Two holes were drilled, some burlap as ribbon and it was done. I also got the stairway basket below which is big and heavy and I wanted it too. I forgot before photos - the basket was a light color with red and green bands woven on the top. Brawn painted it when he painted the porch furniture, and the tray was exactly the same except now it has chalkboard paint in the center. I am going to hang a number tag on the basket, but my day is over - I got dressed at about 5:00 when Brawn pulled in the driveway. So far no one has used the basket for anything; stinky socks are still dropped right next to it as well as any books that need to go down the stairs. The last thing I did today was buff the rocking chair I waxed a week ago, and I had painted it a week before that. If you are keeping track, I was not in my jammies for the final project. The buffing really really made the wax shine. The chair was my mom's - not vintage, just a nice solid rocker for singing to my grand babies and it needed an update. Some distressing makes it seem like it has been around longer than it has. **Don't forget to enter the cool porcelain RamSign giveaway here. You have till Saturday, winner announced on Sunday. I always check out my new followers. So don't sneak in and think I won't notice you. Yesterday I spotted a new one with the name Gadget in it. Inspector Gadget is in the house.... the birdhouse that is. Sounded interesting so I went to read more and found myself looking at every single thing this guy makes. He does the type of stuff I always imagine my husband doing when he retires. I'd pay Brawn now to do it if it would get rid of all the schmidt in the garage. 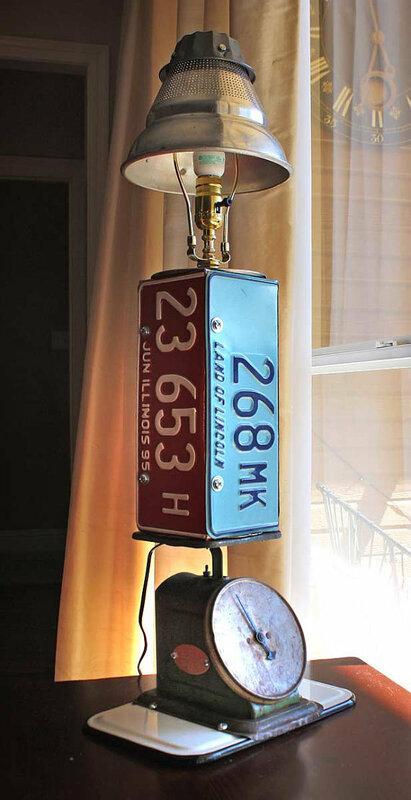 Brian transforms junk into amazing junk. Birdhouses out of anything you can think of. 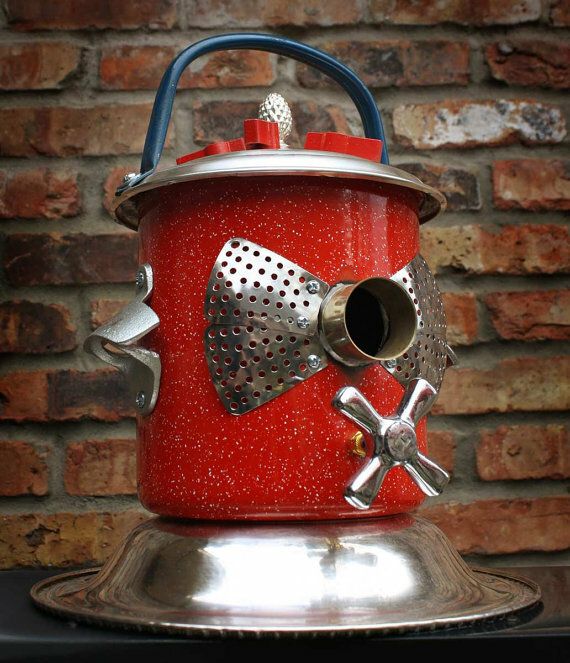 If you want to see more go take a peek at his website GadgetSponge, or his etsy shop where you can buy his creations. He also re-purposes items out of wood. Look closely at all this to spot what he uses for the details. I think the birds that fly in after Winter to live at my house would feel styl'in if they had a house like this. Or this, the Chevy version for fast birds. 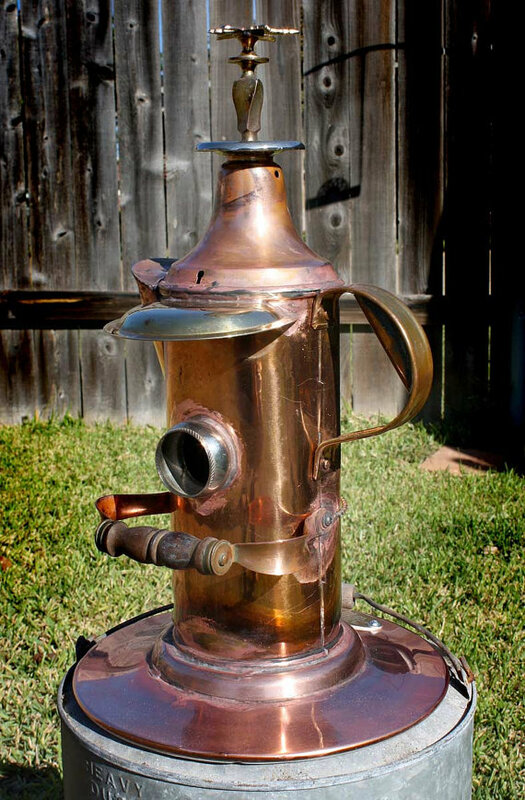 This copper beauty would look good at a certain bloggers house. 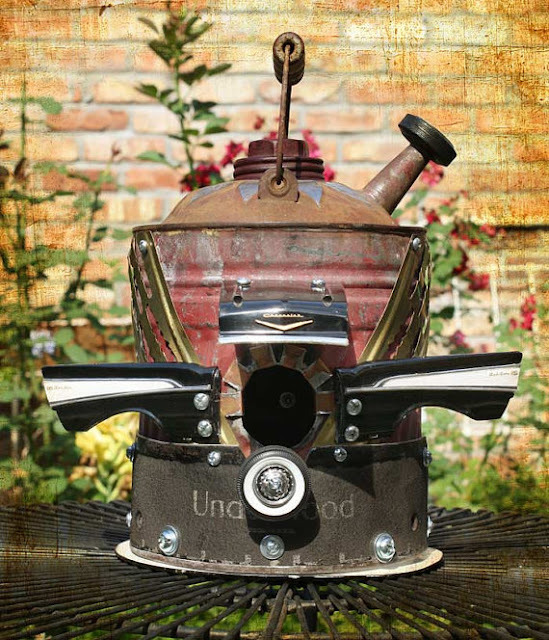 Kim @ SavvySouthernStyle collects Copper Molds. 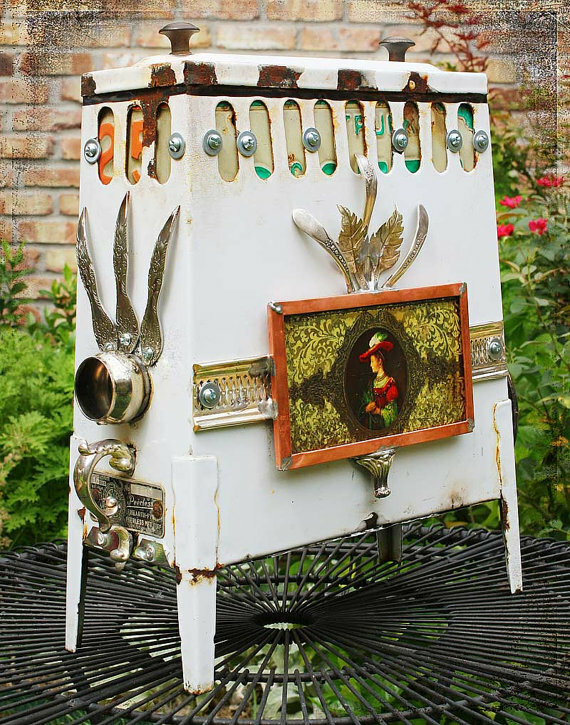 I think she needs this birdhouse in her Southern yard. I have to say it again... remember to look at the details. This red house is my favorite just for that reason. 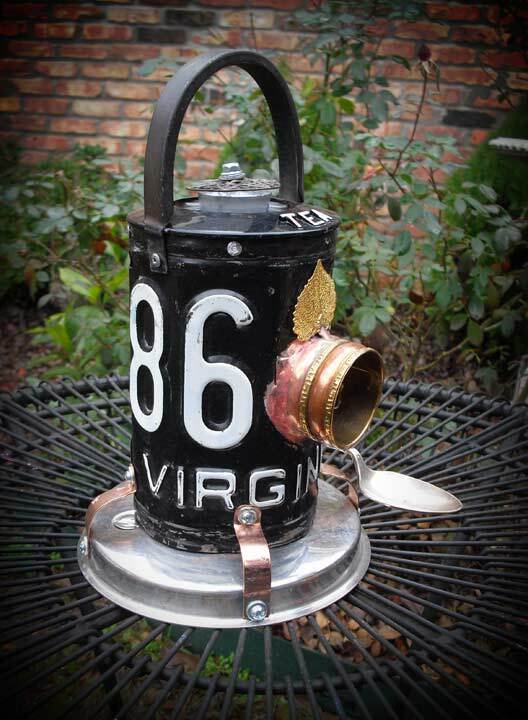 Yes Virginia there is a birdhouse for you. Holly over at DownToEarthStyle told us yesterday her house is on the market and she's moving to Virginny! I can see this birdhouse IN her new house. Last is a lamp made by Brian. It's just darn cool. It's not quite right yet to me, but I really have come a loooong way with my mantel. but I have not got around to blowing them out. Poppa Rabbit had to have his ear glued on for this gig. See they are watching their babies in the grass through the window. It's simple and I like just the bit of color, but I tell 'ya some tulips would be great. Here in Minnesota if you have a 3 season porch, for the 4th season it becomes a walk in cooler. Great cold food storage when you host a holiday - I never have to make room in my fridge for a turkey. The porch doesn't get used from November to April, unless you have a warm March like right now. All the bugs freeze and drop dead in wait of the thaw for spring cleaning. The cleaning came early this year, due to the Route 66 cabinet redo. That cabinet holds summer towels and lives in the cedar porch. Once it was painted I had to clean the porch - just in time too, we had unseasonably warm weather. It's not the summer kitchen I was dreaming of like here at the SavvyCityFarmer but I am going to take a couple ideas from her porch yet for mine, like the tin awning where the stuffed trophy fish is/was. Bet you wish you had a stuffed trophy fish. He's been hanging there for a long time. I hate him, but if used as the pillow he was intended to be, it works pretty good for an afternoon nap. The picture is of a cart with flowers - so faded all the colors are the same. The porch has needed - and I have wanted - a redo for years, but it needs new windows so I told myself when that happens we will freshen it up. It still needs the windows; not in the budget. The furniture is 25 years old. The cushions are still firm and the frames perfect but everything out there was the same wood color so it got sprayed espresso to change them up. The ticking fabric needs to go... that isn't in the budget either but I actually like how it looks with the dark stain. We didn't spend one cent in this room, and that IS in the budget! We changed the arrangement to allow for a path from the deck door to inside without cutting through the sitting area. Works much better and everyone can put their feet up on the table now, not just those taller than 5'2". I gave the wheelbarrow a coat of AS dark wax and it made a big difference. I think I'm going to paint "flowers" on the side. Brawn made it years ago when he caught me looking at one in a catalog that cost a couple hundred dollars. Thank goodness he never knew how much the furniture cost 25 years ago, but I'd say we have got our money's worth out of it. The cushions have been ticking for at least 15 years and the valance is ticking and fabric with little porch chairs. No... not in the budget and I can't sew anyway. My favorite part of the room is the old milk jug table, I love it. I think I even love it more than my Route 66 cabinet. I sponged a checkerboard on the top of the ice cream table, dark waxed it and sanded. I couldn't find any checkers so if you want to play you have to use chess pieces. We won't talk about the math it took for me to line that part up. In fact we won't talk about if it is lined up either. I used ASCP in old white on the pine frame and painted chalkboard paint right over the glass. It came from Pottery Barn. Tuff. Each window has a roman shade that I never use. The dinner gong says come and get it, and clangs just like when the cook would call everyone for chow. The idea was when the kids were little I could alert them to lunch being done if they were swimming. It was easier to just yell LUNCH!! Don't forget to enter my first giveaway..... RamSign going on here at my lil 'ol blog.